In the very late afternoon a spectacular meteorite shower was seen over several states before thousands of fragments fell near Holbrook. The largest was 6.6 kg (14.5 pounds) with others as small as a few mg. A number of them had well developed fusion crusts. Chondrules (0.5-1.5 mm in diameter) consist mainly of granular olivine and finely prismatic low-Ca orthopyroxene. They are intergrown within a recrystallized matrix which is also rich in olivine and pyroxene (much finer-grained) and is accompanied by Fe-Ni metal and troilite aggregates. The aggregates are scattered through the matrix and occasionally rim chondrule edges. Minor albitic plagioclase (An15), clinopyroxene, and chromite are in evidence as well as several other very minor accessory phases. Holbrook is a member of the relatively sparse L/LL ordinary chondrite geochemical group which have total iron abundances intermediate to those of the L and LL chondrites (relatively low and very low iron, respectively). Only 11 witnessed L/LL falls are known to have been recovered (Meteoritical Database, January 2016). More specifically, Holbrook is one of only four witnessed falls listed exactly as L/LL6 ordinary chondrites at the Meteoritical Bulletin Database. The others are Cabezo de Mayo, Trysil, and Sultanpur. Merrill, G.P. (1916) Handbook and descriptive catalogue of the meteorite collections of the United States National Museum. Smithsonian Institute Bulletin 94. Washington, DC. Galbraith, F.W. (1947), Minerals of AZ, AZ Bur. Mines Bull. 153: 11, 20. Mason, B. & Wiik, H. B. (1960) The Holbrook, Arizona, chondrite. Geochimica et Cosmochimica Acta 21(3-4): 276-283. (Jan 1961). Mason, B. (1962) Classification of Chondritic Meteorites: American Museum Novitates, #2069. 20 pages. (May 1962). Fuchs, L.H. (1969) The Phosphate Mineralogy of Meteorites: IN: Meteoritic Research: Millman, P.M.-Ed. : pp. 683-695.D. Reidel Publishing Company: Dordrecht-Holland. Gibson, E. K., Jr. (1970) Discovery of Another Meteorite Specimen from the 1912 Holbrook, Arizona Fall Site. Meteoritics 5(1): 57-60. Socki, R. A., Gibson, E. K., Jull, A. J. T., & Karlsson, H. R. (1991) Carbon and oxygen isotope composition of carbonates from an L6 chondrite: Evidence for terrestrial weathering from the Holbrook meteorite: Meteoritics 26(4): p.396. (Dec 1991). 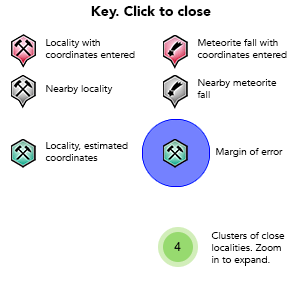 Grady, M.M., Pratesi, G. & Moggi-Cecchi, V. (2015) Atlas of Meteorites. Cambridge University Press: Cambridge, United Kingdom. 373 pages.